We spent a couple of days in August scanning in suburban Luton. Not necessarily the most glamorous, or even obvious location for scanning vegetation. But this work was for a colleague, Dr. Steve Hancock from Exeter University, who we've worked with for several years - since he graduated as one of our PhD students in fact. Steve's research interests include using terrestrial and airborne lidar to measure canopy properties, and using this information in radiation models, and ecological models more generally. Steve's currently working a 6-year NERC-funded research programme called BESS (Biodiversity and Ecosystem Service Sustainability). One of the themes of BESS is F3UES (Fragments, Functions, Flows and Urban Ecosystem Services). 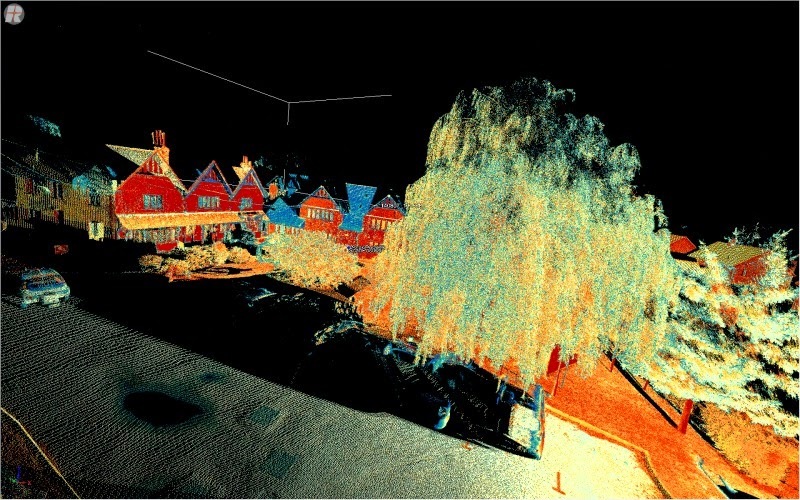 Steve is looking at ways to measure the structure of vegetation in urban areas in a fine-grained way, in order to assess its utility as an ecosystem. Related work is going on mapping bird and insect distributions in the same areas in order to assess ecosystem value. Small, fragmented urban areas of vegetation (gardens, parks etc) are generally overlooked when spatial estimates of habitat are made at scales of 10s of m or greater - they are often too small or irregular, or variable, to be included. 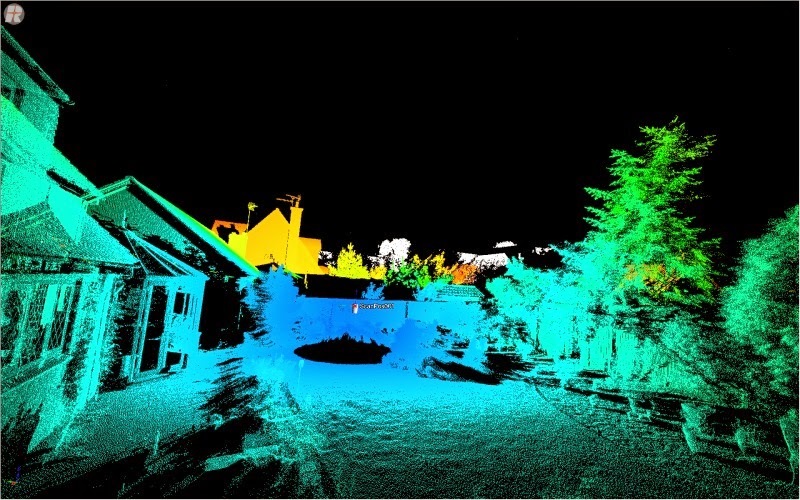 Steve asked us to come and scan some of their core sites in Luton that he had identified from airborne lidar as potentially containing interesting pieces of vegetation. 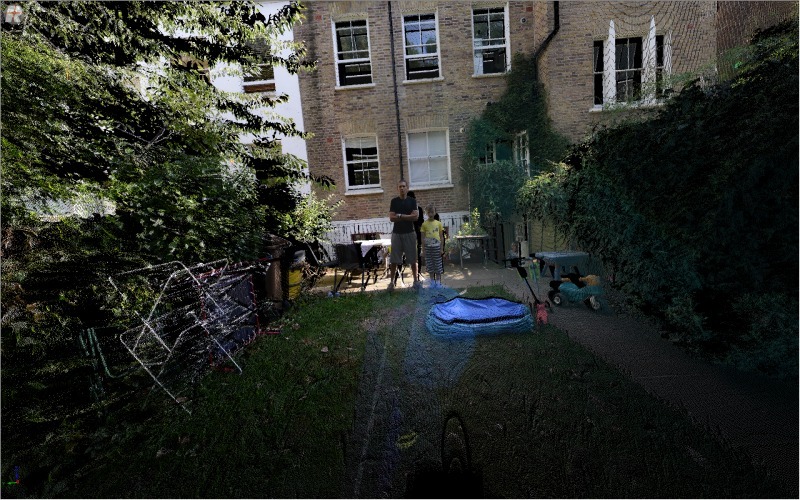 We took the TLS into these areas (including a Girl Guide hut garden, suburban garden, street front and the large, mature garden of a residential care home) and collected scans of the dominant vegetation. RGB (top) and range (bottom) from a suburban garden, flowerbeds and ornamental shrubs. 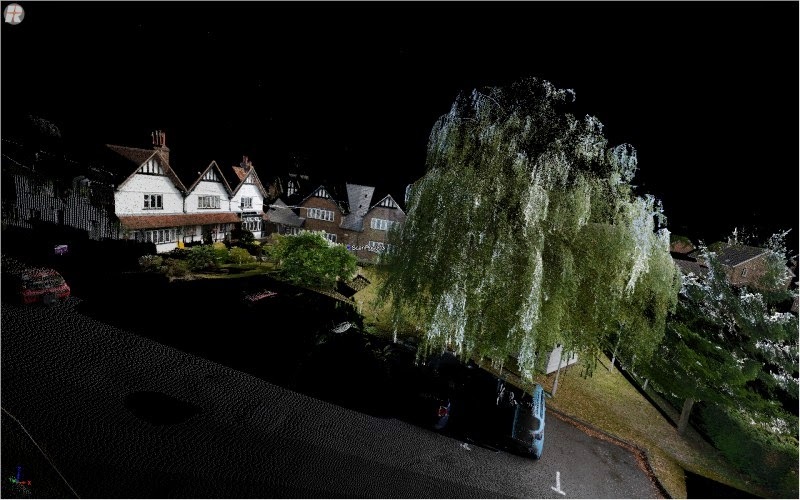 Scanning in back gardens, sitting on a bench and with the kind offer of a nice cup of tea from the house owner certainly makes a change from struggling through tropical forests, or even standing in English woodlands in the rain. 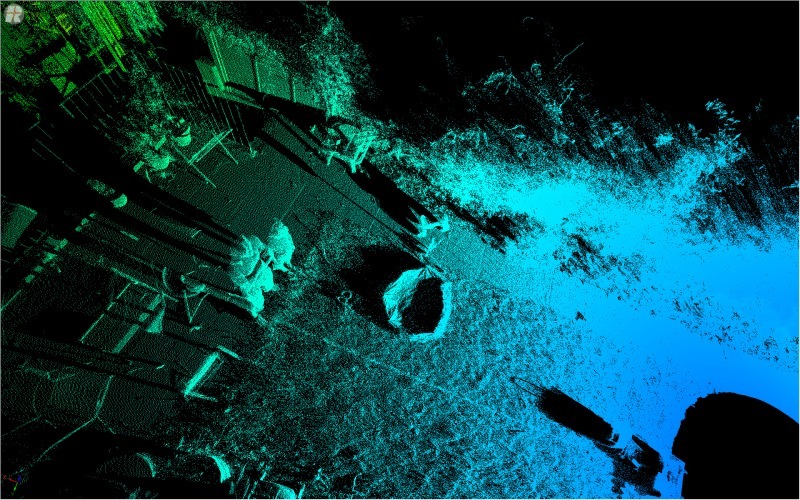 RGB (top), intensity (centre) and range (bottom) from an urban carpark with a large willow in the foreground. 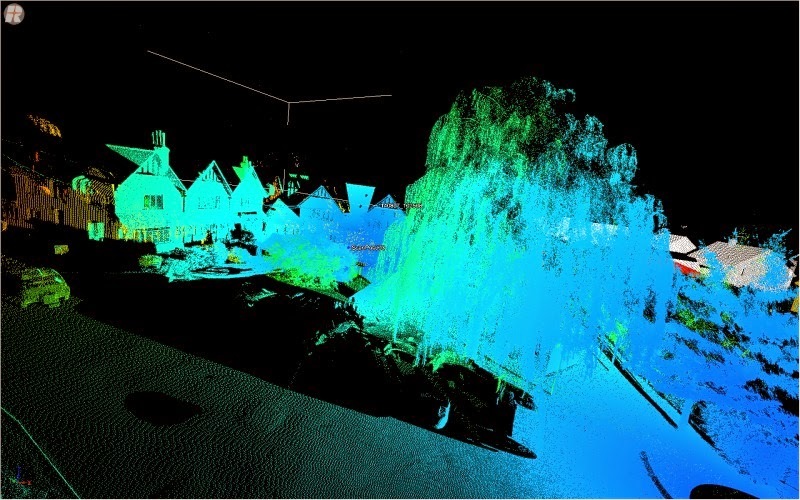 I'm looking forward to working more on these data with Steve over the coming months, relating to the airborne lidar data he has, and trying to explain the properties of the lidar waveform data. Ultimately, Steve aims to provide a better characterisation of the ecosystem structure and value from this type of analysis, which will be both novel and illuminating. 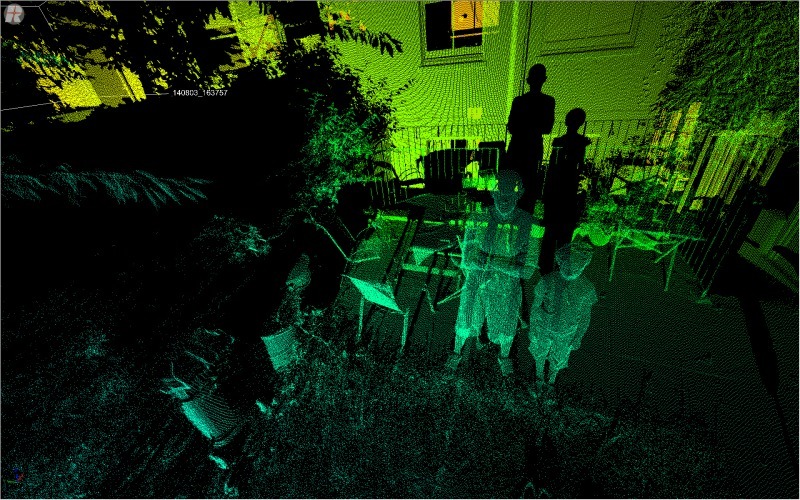 My 9 year old son was asking whether we could scan ourselves and the house, and so, having the equipment at home before visiting one of our field sites I thought "why not?". Scanning in a tight, built-up environment like this illustrates some interesting aspects of the scanner geometry and the camera properties. 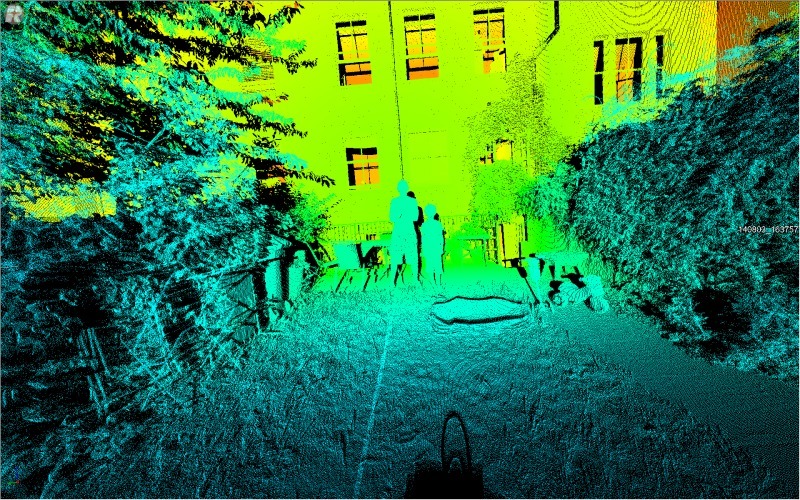 RGB (top) and distance-coloured scan (bottom) of rear of house, and me and Rudi. The detail you can see always amazes me, and this is far from the highest resolution the scanner is capable of (100 times finer) and the image resolution is low to get it under the blogger 300k image size limit. Close up of scan showing rear detail and shadows. The lower view shows the scanner shadow behind our figures, with my very characteristic (apparently) ears showing prominently. It can be hard for people who don't know how the scanner works to understand how you can view from any point, even where the scanner can't see due to shadowing/occlusion. 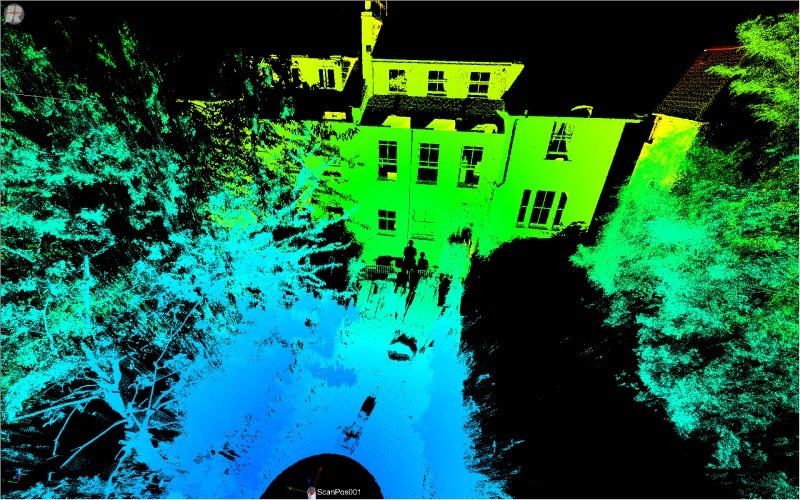 Rear elevation of the house, from high in the virtual lime trees. View from above, showing the upturned paddling pool and even Rudi's crocs in front of him. 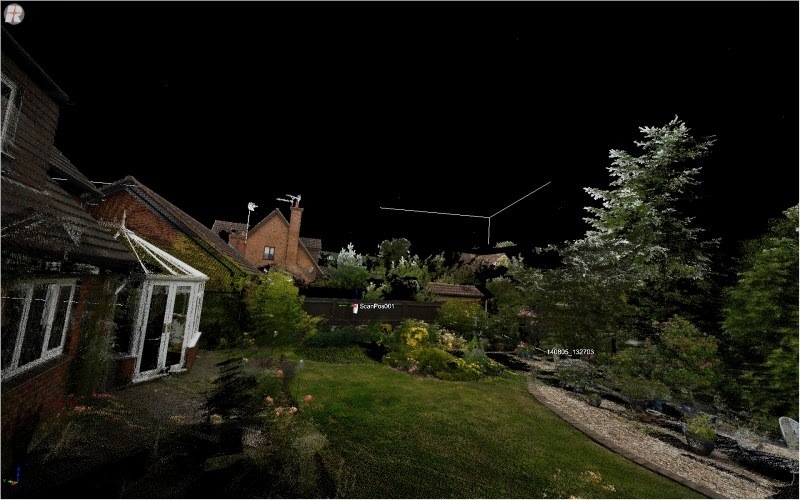 Next time I've got the scanner at home I might try and scan with targets to do a registered point cloud.